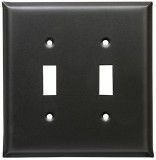 Combination Duplex/Toggle switch wall plate 4 7/8" wide by 5 " high. 2 Southwest designs: Indian and Thunderbird in 3 finishes: Arizona Sand, and Terra-Cotta and Adobe Gray finishes. We manufacture 53 electrical configurations in up to 8-gangs and all in stock ready for delivery. To see all our finishes, please click on "See Details & Order" below. 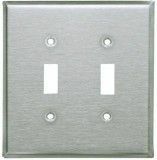 To view all our finishes, please click on the "View detailed images above". We manufacture 53 electrical configurations in up to 8-gangs and all in stock ready for delivery. 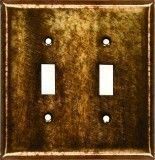 To see more custom finishes or products, click the links on the left.